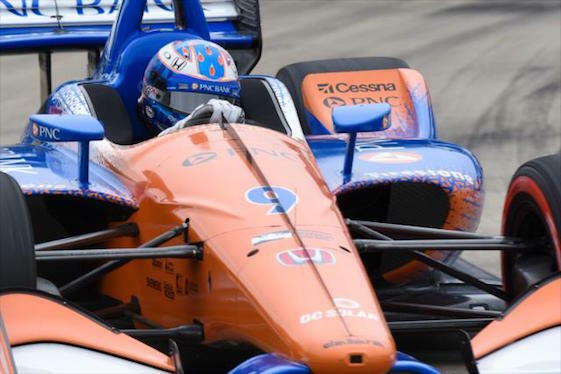 Two sessions of practice Friday for the season-ending INDYCAR Grand Prix of Sonoma did little to separate the four remaining contenders for the 2018 Verizon IndyCar Series championship. Point-leader Scott Dixon was third on the combined-session time sheet at Sonoma Raceway in Northern California. The four-time series champion from Chip Ganassi Racing was sandwiched by Team Penske’s Josef Newgarden and Will Power _ each 87 points behind Dixon and admittedly harboring slim title hopes. Meanwhile, championship runnerup Alexander Rossi of Andretti Autosport _ 29 points out of the lead _ came within a half-second of the other contenders while winding up 11th on the combined sheet. With double the normal race points to be awarded Sunday, the title outcome remains in doubt heading into Saturday’s knockout qualifying session. Dixon’s clearest path to a fifth series championship is to finish first or second, as the winner will earn 100 points and second place will pay 80. “Conditions were a little tough today and we’re down around 30-40 percent overall on downforce compared to last year,” said Dixon, driver of the No. 9 Honda. “(Saturday) could be different and tricky. You have to get the braking right for sure. There was a cool spread on the time sheets today _ and it was pretty cool seeing an Indy Lights champion (Patricio O’Ward) up there mixing it up. Newgarden, the reigning series champion, set the fast lap of the second practice at 1-minute, 17.8156- seconds/110.338 mph in the No. 1 Team Penske Chevrolet. That lap ranked second on the combined speed chart for two sessions around the 2.385-mile/12-turn permanent road-course. Power, the 2014 series champion, placed fourth in both practices and settled in at fourth on the combined time sheet. His best lap of 1:17.8818/110.244 mph in the No. 12 Team Penske Chevrolet was logged in the morning session. Rossi felt his Andretti crew made progress with the No. 27 Honda from the first practice, when he was eighth, to the second, when he ran sixth. At 11th on the combined chart, the native Californian was far from discouraged. Ryan Hunter-Reay, Rossi’s Andretti teammate, posted best lap of the day during the opening practice. Hunter-Reay toured the Sonoma circuit in 1:17.5742/110.681 mph in the No. 28 Honda. O’Ward _ the aforementioned newly crowned Indy Lights presented by Cooper Tires champion making his IndyCar Series debut _ was a surprising third in P2. The 19-year-old native of Mexico turned a best lap of 1:18.0073/110.067 mph in the No. 8 Chevrolet. “It was a pretty good day and I’m very satisfied with how we ended,” said O’Ward, a resident of San Antonio, Texas. “The first practice felt like a shot out of a cannon because there were so many (more) cars out there than what I was used to, and I didn’t get any clean running. The 29 points separating Dixon and Rossi is the fifth-largest margin with one race to go since 2006. The closest margin with one race to go was 2006, when Team Penske’s Helio Castroneves led Sam Hornish Jr. by one point. The average deficit with one-to-go since 2008 is 20.3 points. Dixon has seven top-five finishes in 13 Sonoma starts, including wins in 2007, 2014 and 2015. Rossi finished fifth in his first start at Sonoma in 2016 while Power has five podium results in nine starts, including wins in 2010, 2011 and 2013. Newgarden has one top-five finish at Sonoma. He recorded his best finish (second) in six starts in 2017. While Rossi will be chasing his first series title, Dixon will take the point lead into one-to-go for the fifth time in his stellar career. Dixon, who took the championship lead following his win in the annual June night race at Texas Motor Speedway in Fort Worth, won championships in three of the previous four seasons in which he led with one race to go (2003, 2008 and 2013). Sunday’s race, scheduled for 85 laps/202.7-miles, will mark the 13th consecutive year the series champion will be determined at the final event of the season. Additionally, the winning driver at Sonoma has claimed the championship three times in the prior 14 races _Dario Franchitti in 2009, Dixon in 2015 and Simon Pagenaud in 2016. A final practice is set for 2 p.m. (EDT) Saturday and will stream live on RaceControl.IndyCar.com. Verizon P1 Award qualifying starts at 6 p.m. Saturday and will stream live on RaceControl.IndyCar.com, with a same-day telecast at 8 p.m. on NBC Sports Network. Sunday’s live race coverage begins at 6:30 p.m. (EDT) on NBCSN and the Advance Auto Parts INDYCAR Radio Network. Spencer Pigot will return to Ed Carpenter Racing as driver of the No. 21 Chevrolet for the full 17-race 2019 Verizon IndyCar Series season, marking his fourth year with the team and in the series. Pigot’s first fulltime campaign in 2018 has included career-best qualifying and finishing positions on street courses, road courses and ovals, including his first podium result. Three of Pigot’s last six races have resulted in the three strongest results of his career. Pigot scored his first series podium with a second-place at Iowa Speedway, the fourth consecutive year ECR has had a driver finish first or second on the short oval. A sixth-place finish came on the Gateway Motorsports Park oval, followed by Pigot’s best career road-course finish one week later with a fourth at Portland International Raceway in Oregon. Carpenter will continue to drive the No. 20 Fuzzy’s Vodka Chevrolet on ovals in 2019 for what will be his 17th year of INDYCAR competition. The road and street course driver for the No. 20 Chevrolet will be announced at a later date. Formed in late 2011, ECR entered the Verizon IndyCar Series fulltime in 2012.The team has collected seven wins on each type of track on which the series competes _ street and road-courses, short ovals and speedways. ECR Chevrolets have started on the front row of the Indianapolis 500 five of the past six years, including Carpenter’s three pole positions. When he earned P1 for the 2018 Indy 500, Carpenter became just the 10th driver in the 102-year history of the race to earn three or more poles. The Indianapolis-based team has 25 top-five finishes to-date, 19 of which have been podiums.